XPOWER Manufacture Inc. brings over 25 years of experience developing an expanding series of products with the most advanced technology in today’s market. By creating a fully integrated design with state-of-the art miniaturization, XPOWER’s innovative equipment is lightweight, quiet, and rugged – without sacrificing power or durability. XPOWER is continuously identifying and investing in advanced manufacturing technologies, including CNC injection molding equipment and a robust R & D team. Our highly trained engineering department is an active participant in the creation of fully integrated motor, housing, and fan designs. The resulting finished XPower air movers conform to the highest standards of efficiency, balance, and reliability. As the manufacturer, XPOWER closely controls the safety of its products and maintains the highest standards in the industry with globally recognized Safety Certifications and thermally protected motors. 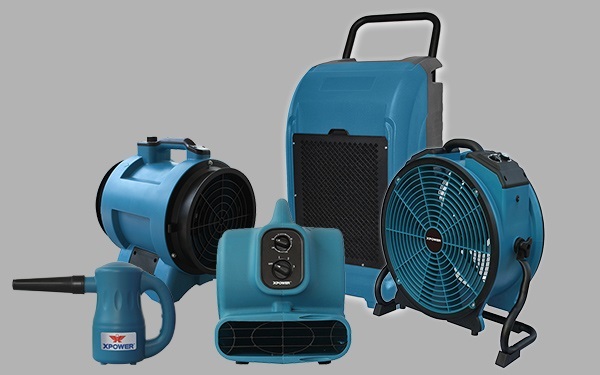 Browse our selection of XPower equipment, including XPower air movers.